An all around workhorse for sport and trad climbers, Edelweiss' Axis II utilizes an EVERdry™ treatment from extended life and increased useability. An all around workhorse for sport and trad climbers, Edelweiss&apos; Axis II utilizes an EVERdry™ treatment from extended life and increased useability. Edelweiss was the first climbing rope maker to apply a Supereverdry treatment to its fibres. The benefits of a everdry treatment are self-evident: the ropes are lighter in case of humidity, dry quicker and don&apos;t tend to stiffen due to freezing. The everdry treatment is applied to all fibres in the core and the sheath. Comparative tests demonstrate the superiority of this treatment over competing methods of other manufacterers with repect to durability as well as efficiency. HD Cover is a technology through which, each cover thread is individually controlled, as opposed to standard braiding where the threads are controlled by pairs. 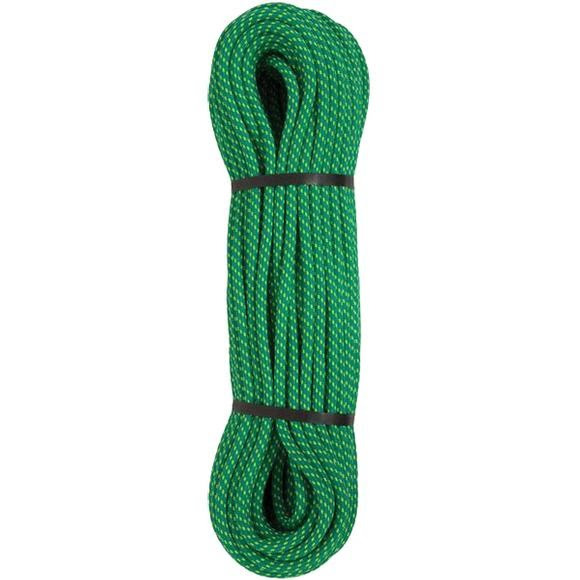 With this High Definition braiding and although the thickness of the sheath remains the same, the rope surface is much smoother than with a standard braiding, the rope doesn&apos;t generate extra braking in belay systems and actions become more comfortable; another positive consequence, the wear due to abrasion is also reduced and the rope lifetime accordingly extended. improved flexibility = increased comfort. improved energy absorption = increased safety. weight reduction = increased performance. This rope is used as a single strand. It is best adapted to difficult routes which are fairly straight-line, to easy routes without change-over belays, and where descent is not by abseil. It is in particular the rope for sport climbing.